I love food. Like, a lot. It may not seem like it from all the healthy food and “lose weight” posts I do, but the reason I work out and eat healthy as much as possible is so I can have sporadic splurge meals without feeling guilty ― especially on the weekends or when I’m going out with friends. You can only eat salads (no matter how yummy they can be) for so long. I mean, there’s a reason God invented pizza, tacos, and carne asada fries, amiright? In the end, it’s all about balance, so when I pig out, I do try to control myself. Still, it can be difficult to keep that up during the week. And if you’re eating salads or healthy smoothies for lunch, many times you find yourself ravenously hungry only a couple of hours later. It is at those desperate times that we tend to reach for the easiest and closest snacks like chips or cookies, ruining the calorie deficit we just created with our salads. If you work in an office ― and honestly I can’t think of any friends that don’t work in one ― you more than likely have a coffee shop or bakery close by. Office life equals coffee and more coffee. And what foods happen to pair perfectly with that freshly brewed deliciousness? Baked goods. It’s a blessing and a curse. I should know ― there’s a Starbucks right next door to my building, another coffee place with GIANT baked goods a few steps beyond that, a cafe across the street from that, and a Coffee Bean a block away. It’s torture. So, to combat my cravings, I have to keep healthy snacks at my desk. Because they’re literally inches away from me, I end up reaching for those rather than wasting time to leave my building and spending money on snacks that in the end aren’t good for me. I recently realized that a lot of people might also have this problem ― my coworkers do, too, and they all eat pretty healthy ― so I decided to share some of my own snack preferences. These are easy and cheap, you can keep them in your desk at work, and they won't go bad right away. Before you know it, you’ll be reaching for these snacks and improving your health and overall self-control at the same time. Ah, popcorn . . . that salty, buttery goodness. Luckily, popcorn is really healthy and is a great snack because you can keep microwavable packets at work (Costco’s Kirkland brand is delicious by the way, and you’ll get a lifetime supply) or opt for those preprepared 100-calorie bags like Skinny Pop or Pop Art. Although the majority of popcorn options are healthy and completely fine, it won’t hurt to check the nutrition facts. There shouldn’t be more than a few ingredients, like salt, oil, and maybe some seasoning. Nuts are the perfect snack because they’re wonderfully salty, keep your mouth busy, and help you feel full faster. I buy the Mixed Nuts tub from Costco (about $17), which lasts me a really long time. If that’s too expensive, they also sell an equally giant tub of peanuts for about $7. If you don’t have a Costco membership, obviously any grocery store will have them, and Trader Joe’s also has a great nut section with walnuts, pecans, almonds, and everything else you can think of. Just remember: everything in moderation. 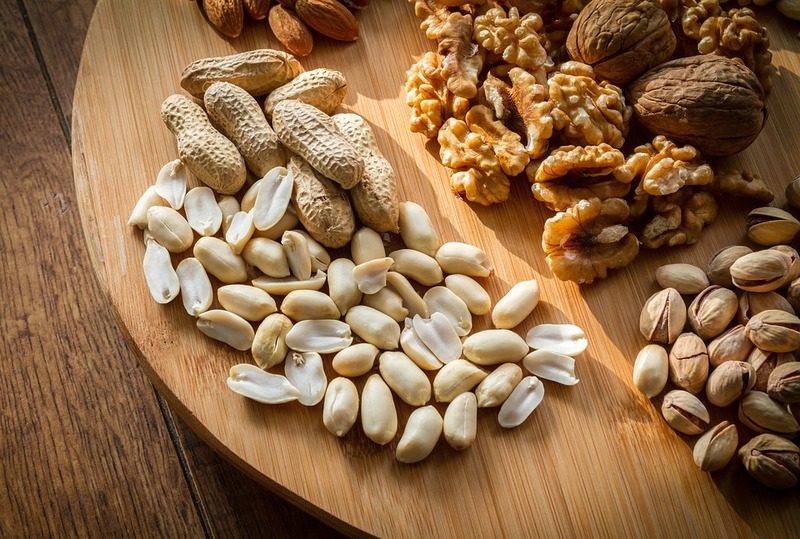 Nuts, while rich in protein, do have a lot of fat, so don’t go crazy. Dried fruit is great to have on hand because it won’t go bad like fresh fruit, and it can easily be mixed with nuts and chocolate to make an oh-so-satisfying sweet-and-salty trail mix. Just be aware that many — and I mean many — versions out there add massive amounts of sugar, stripping away the healthiness of the snack. If you haven’t noticed, fruit is sweet on its own and doesn’t need additional sugar to make it taste better. Basically, if the ingredients on the back say “[insert fruit name], sugar” then steer clear. Costco has a few options that are literally just the dried fruit without any additives, and Trader Joe’s also has a few. My favorite snack from Trader Joe’s is the bag of dried sliced bananas, which is just bananas and coconut oil. I love mixing them with nuts for my homemade trail mix! I LOVE chocolate. Sometimes when you’re having a bad day at work, all you need is a piece of chocolate to make the world seem a little less unforgiving. Instead of buying candy at the checkout line of the grocery store (my hands always shakily reach out for the Reese’s before sadly pulling back), keep a bar of dark chocolate at work. Keep in mind that dark chocolate is still loaded with calories and fat (it is chocolate), so DO LIMIT your intake. However, comparatively it’s better for you than milk or white chocolate and has been known to contain antioxidants and lower blood pressure and cholesterol. So if you must have chocolate, keep it dark. You can also mix in dark chocolate chips in your trail mix. Apples are an excellent snack to keep at your desk because they give you energy, they’re sweet (or sour, if you prefer green apples), and don’t go bad as fast as other fruits like bananas. Many food websites out there recommend almond butter, and while almond butter is super delicious, it is pricey. So to save a few dollars, go with good ole peanut butter. A classic combination, apples and peanut butter are salty and sweet and are the quintessential healthy snack. Pretty much any peanut butter will be healthy, as any sugar is added in limited amounts, but I personally go with Laura Scudder’s All Natural Peanut Butter. You can get a pack of two from Costco for about $5, and it comes in nice glass jars. The ingredients are literally just peanuts and salt, and it’s delicious. Chickpeas on their own aren’t that great ― like that’s what hummus is made of. But when you roast them in the oven? You get a crunchy, nutty, easily addicting snack that you can season however you want. Simply flavor them with salt and pepper, or get creative with Cajun, chili-lime, and honey-roasted versions. And the best part? A can of chickpeas costs $1 or less at the grocery store, and the snack lasts about a week. You can season it to taste, and it’s gluten-free. If you’re a meat eater, beef jerky is a great snack to have on hand because it contains a lot of protein and will keep your mouth and jaw busy. Many times, especially in a work environment, we’re used to multitasking. If we only have one task to do, our brains freak out, so we reach for food ― not because we’re hungry but because we’re bored or our bodies need an activity to do. Beef jerky requires a lot of chewing, so, if anything, the constant mastication will help you concentrate, as well. The great thing about pumpkin seeds is that they give you that satisfying crunch you crave from nuts or chickpeas, but they’re also packed with nutrients. So if you don’t like nuts or are allergic, pumpkin seeds are an excellent alternative. They’re packed with protein, vitamins, healthy fats, fiber, and minerals. Plus, like chickpeas, you can roast them in the oven and season them however you like!